ShapeShift CEO and longtime crypto entrepreneur Erik Voorhees, tweeted to his 333K Twitter followers that his crypto-to-crypto exchange had also decided to delist Bitcoin SV. 'We stand with Binance and CZ’s sentiments', Voorhees tweeted, adding that Bitcoin SV will be de-listed from ShapeShift within 48 hours. Binance had announced that Bitcoin SV will be delisted from the exchange following earlier warnings of CEO Changpeng Zhao. CZ clearly has had it with Craig Wright, the man behind Bitcoin SV, who went after the Twitter account @Hodlonaut for denying claims of Wright that he is Satoshi Nakamoto. Binance said in a statement that Bitcoin SV does not meet the standard to be available for trading on the platform and will be delisted on April 22 at 10AM UTC. While both Binance and ShapeShift have already decided to de-list Bitcoin SV in the next few days, another influential exchange, the San Francisco-based Kraken, is apparantly as well considering to de-list BSV. 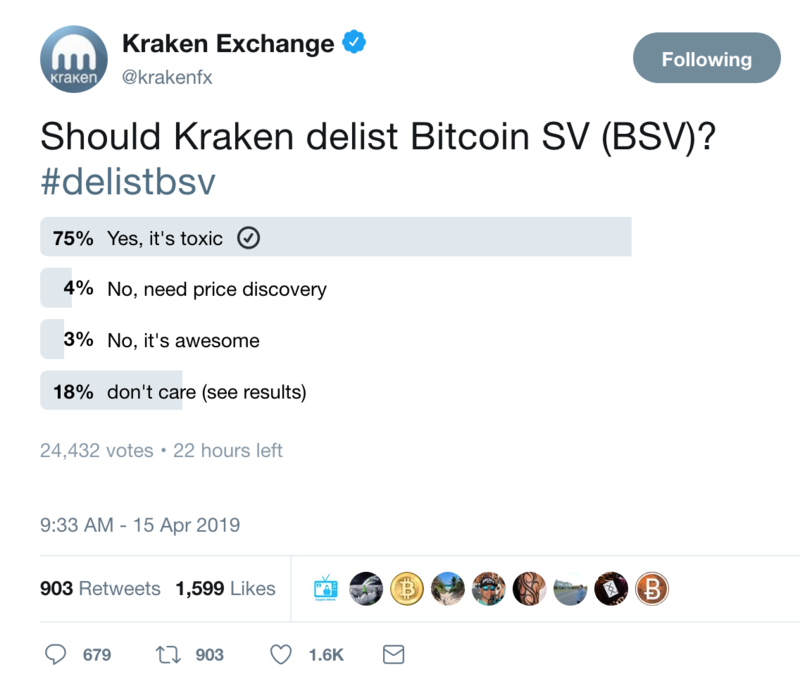 Kraken is asking the Twitter crypto universe in a poll whether the exchange should as well de-list BSV. At the time of writing an overwhelming majority of 75% has answered YES to that question and 18% couldn't care less. That's another de-listing waiting to happen. The crypto community is wondering if this might be 'Game Over' for BSV? King of the shitcoins. The price of $BSV is fast approaching 1% of $BTC. SHA256 miners will be unable to pay their bills mining $BSV. OTC premium over illiquid markets will reach 15% easy. ATMs won't be able to source coins. $BSV hodlers have no options left. Read more: CZ backs Peter McCormack: "Everyone is Satoshi, except Craig Wright!"